In this bulletin, we delve into an active area of climate research that is investigating how warming may affect atmospheric circulation and lead to more extreme weather. In recent years, major flooding events, heat waves, and droughts, have prompted researchers to examine the conditions that produced those extreme events and ask whether climate change might be playing a role. Meanwhile, a number of Climate Smart Land Network (CSLN) members have noted that extreme and/or persistent weather is creating challenges for forestry operations (e.g. extended wet periods that require equipment to be pulled out of the woods). Here we examine whether those weather patterns are symptomatic of an emerging trend and what to expect in the future. In a previous bulletin we described how climate change will alter the frequency and intensity of some weather and climate extremes, like record heat, heavy rains, and drought (see Climate Change and Extreme Weather Part I: Trends & Projections). Those categories of extremes are related to the physics (i.e. thermodynamics) of climate change—rising average temperatures lead to more record-breaking heat, a warmer atmosphere holds more water vapor leading to heavier rains, and so on. It is relatively straightforward to measure these types of extremes and there is a high degree of confidence regarding how they will change in the future. But warming can also affect the mechanics (i.e. dynamics) of the climate, including aspects of atmospheric circulation like wind and pressure systems. Dynamics are the key to understanding and predicting weather at the regional level, including future changes in extremes in the mid-latitude regions where most CSLN members own and manage land. These are the kinds of changes that can lead to counterintuitive impacts like warming winters that include deep cold snaps driven by southern incursions of Arctic air (which we discuss below). Changes in atmospheric circulation are more difficult to consistently and accurately measure or model than the thermodynamically-driven changes mentioned earlier (Palmer 2013; Shepherd 2014). Nonetheless, this is an emerging area of research worth watching because, as one researcher put it: “Though the uncertainties are large, changes in atmosphere dynamics have the potential to cause rapid transitions at a regional scale leading to surprises for society” (Coumou et al. 2018). The persistence of a weather system can quickly elevate a moderate event to something more extreme. A day of rain is no problem, but multiple days of rainfall become an issue when saturated soils lead to flooding. Likewise, hitting a new record high temperature may just be an interesting statistic, while a long heat wave can have real costs for energy use and human health. Persistent extremes can happen when weather systems move more slowly or when there is atmospheric blocking that causes a system to stall in a particular location. A persistent low pressure system leads to rain and flooding (such as the record rain with Hurricane Harvey), whereas a persistent high pressure system leads to heat, drought, and wildfire (such as the conditions in California in summer 2018) (Mann 2018). One of the big questions in atmospheric research right now is whether climate change is leading to more persistent weather patterns. In recent years, there has been a lot of conversation in the media and elsewhere about the idea that change in the Arctic—an area that is warming twice as fast as the rest of the world (Osborne et al. 2018)—is leading to unusual weather in mid-latitude regions like the U.S. This includes the so-called “polar vortex” events, when Arctic air drifts south and causes a deep freeze over parts of the northern U.S. In fact, the polar vortex is nothing new (see box, below), but there has been a vigorous debate among scientists about whether the kind of jet stream activity that leads to these incursions of Arctic air is becoming more likely because of warming-induced changes in the atmosphere. Colloquially, the term polar vortex has come to mean extreme cold from the influx of Arctic air over the continental U.S. (Lyons et al. 2018). In fact, the term has been around since the mid-1800’s and it is described in scientific papers beginning in the late 1940’s (Waugh 2019). Technically, it’s short for the circumpolar vortex, which is a rotating area of cold air and low pressure, high in the atmosphere above the poles. When it expands in winter it can occasionally send Arctic air south into the U.S., which has happened several times over the last few decades (NWS; Waugh et al. 2017). But winter will still be warmer on average going forward, even if we experience more cold snaps from polar vortex events. Changes in the polar vortex are a good example of how warming could actually increase climate variability in certain regions (as we discussed in a previous bulletin). Can it influence the jet stream? Has it done so already? Will it have an effect in the future? Evidence suggests changes in the Arctic certainly can have an influence on the jet stream and much of the debate is centered on the question of exactly how. A variety of pathways have been proposed, including a smaller temperature difference between the equator and the poles, a jet stream with a wavier route or larger (i.e. higher amplitude) waves, changes in the location or strength of storm tracks, or weakening of the polar vortex that makes incursions of Arctic air happen more often (Barnes & Screen 2015; Taylor et al. 2017; Cohen et al. 2018b). Many of these pathways lead to more extreme weather, especially more persistent weather systems that bring prolonged wet or dry periods. For example, the reduced temperature difference between the equator and the poles may slow the westerly wind speed of the jet stream, causing it to become highly wavy and move more slowly from west to east, which would lead to more persistent weather patterns and deeper troughs of cold air from the Arctic (Francis & Vavrus 2012; Francis & Overland 2014; Francis et al. 2017). Other research has suggested that we may increasingly be seeing conditions that cause atmospheric waves to resonate and become amplified (much like resonance increases the intensity or loudness of a sound from a musical instrument), which is also associated with more persistent and extreme weather (Petoukhov et al. 2013a; Palmer 2013; Mann et al. 2017). There is disagreement about whether there has already been a discernable effect on the jet stream (at least in a statistical sense). This is because there are different methods being used to detect change, there is a lot of natural variability in the jet stream, and we only have the necessary observational data for the last few decades, which is too short a time period to confidently determine to what degree observed changes are related to human-induced climate change (if at all) (Barnes 2013; Barnes & Screen 2015; Screen & Simmonds 2013; Petoukhov et al. 2013b; Screen et al. 2018). As for whether the warming Arctic will be a significant factor affecting mid-latitude weather going forward, the scientific consensus seems to lean toward the idea that it probably will, but the jury is still out (Barnes & Screen 2015; Taylor et al. 2017). There are a variety of factors in play and it is unclear whether other forces will outweigh or counteract the influence of the Arctic. Although, some research has suggested that these trends are only just beginning to emerge (Francis & Overland 2014; Mann et al. 2017), so it is likely that the science will continue to rapidly evolve on this issue. Over the last several years, a number of CSLN members have reported issues related to stagnant weather patterns that bring prolonged periods of rain or drought. Some of these adaptation approaches have major implications for logging contractors in terms of equipment and personnel. In regions where extreme, persistent weather patterns have been reducing the number of operable days per season, this has become a real challenge for the traditional business model of the logging community. Beyond harvest operations, CSLN members describe a similar notion of preparedness and being “ready to go when conditions are good” in relation to forest fire fighting efforts, especially with longer dry spells and warmer temperatures creating conditions ripe for fire. In a previous bulletin (Climate Change and Extreme Weather Part II: Forest Impacts), we described how “extremes play an equal or greater role [than average conditions] in shaping the distribution, survival, productivity, and diversity of plant communities.” Much of the predicted forest change will be driven by extreme events, especially when those extremes exacerbate other types of forest stress. CSLN members have already reported instances where persistent extreme weather is compounding other stressors. Examples include heavy rains that saturate soils leading to increased wind throw and forest stands with unexpected signs of decline due to the combination of drought and forest tent caterpillar. Ultimately, the impact of a warming climate is not as simple as rising temperatures. In a fluid dynamical system like our planet, global change is complicated and will lead to some counterintuitive impacts and surprises. This includes changes in weather patterns that will affect forest health and harvest operations. There is a growing body of scientific research aimed at understanding and predicting regional weather extremes, but the inherent challenge of modeling such complex and (relatively) small-scale phenomena means that there is a lot of uncertainty. It has been suggested that the research community should move toward “a more explicitly probabilistic, risk-based approach” (Shepherd 2014), which would be helpful for decision-makers who are trying to grapple with this uncertainty. We will continue to watch for updates in this regard. In the interim, it will be important to have a robust forest monitoring system in place to track local change, given that these changes will manifest differently from one region to the next. Barnes, E.A. 2013. Revisiting the evidence linking Arctic amplification to extreme weather in midlatitudes. Geophysical Research Letters. 40:4734-4739. doi:10.1002/grl.50880. Barnes, E.A. and J.A. Screen. 2015. The impact of Arctic warming on the midlatitude jet-stream: Can it? Has it? Will it? WIREs Clim. Change. 6:277-286. doi:10.1002/wcc.337. Cohen, J., Pfeiffer, K., and J.A. Francis. 2018a. Warm Arctic episodes linked with increased frequency of extreme winter weather in the United States. Nature Communications. 9(869). doi:10.1038/s41467-018-02992-9. Cohen, J., Zhang, X., Francis, J., Jung, T., Kwok, R., Overland, J., Tayler, P.C., Lee, S., Laliberte, F., Feldstein, S., Maslowski, W., Henderson, G., Stroeve, J., Coumou, D., Handorf, D., Semmler, T., Ballinger, T., Hell, M., Kretschmer, M., Vavrus, S., Wang, M., Wang, S., Wu, Y., Vihma, T., Bhatt, U., Ionita, M., Linderholm, H., Rigor, I., Routson, C., Singh, D., Wendisch, M., Smith, D., Screen, J., Yoon, J., Peings, Y., Chen, H. and R. Blackport. 2018b. Arctic change and possible influence on mid-latitude climate and weather. US CLIVAR Report 2018-1. 41pp. doi:10.5065/D6TH8KGW. Coumou, D., Di Capua, G., Vavrus, S., Wang, L., and S. Wang. 2018. The influence of Arctic amplification on mid-latitude summer circulation. Nature Communications. 9:2959. doi:10.1038/s41467-018-05256-8. Francis, J.A. and J.E. Overland. 2014. Implications of rapid Arctic change for weather patterns in northern mid-latitudes. US CLIVAR VARIATIONS. 12(3):10-13. Francis, J.A. and S.J. Vavrus. 2012. Evidence linking Arctic amplification to extreme weather in mid-latitudes. Geophysical Research Letters. 39:L06801. doi:10.1029/2012GL051000. Francis, J.A., Vavrus, S.J., and J. Cohen. 2017. Amplified Arctic warming and mid-latitude weather: new perspectives on emerging connections. WIREs Clim. Change. e474. doi: 10.1002/wcc.474. Kretschmer, M., Coumou, D., Agel, L., Barlow, M., Tziperman, E., and J. Cohen. 2018. More-Persistent Weak Stratospheric Polar Vortex States Linked to Cold Extremes. BAMS. 99(1):49-60. doi:10.1175/BAMS-D-16-0259.1. Lyons, B., Hasell, A., and N.J. Stroud. 2018. Enduring Extremes: Polar Vortex, Drought, and Climate Change Beliefs. Environmental Communication A Journal of Nature and Culture. 12(7). doi:10.1080/17524032.2018.1520735. Mann, M., Rahmstorf, S., Kornhuber, K., Steinman, B.A., Miller, S.K., and D. Coumou. 2017. Influence of Anthropogenic Climate Change on Planetary Wave Resonance and Extreme Weather Events. Nature Scientific Reports. 7:45242. 12pp. doi:10.1038/srep45242. Mann, M. 2018. “Climate Change and Extreme Summer Weather Events – The Future is still in Our Hands.” RealClimate. Available online at http://www.realclimate.org/index.php/archives/2018/10/. Last accessed Mar. 3 2019. National Weather Service. “What is the Polar Vortex?” Available online at https://www.weather.gov/safety/cold-polar-vortex. Last accessed mar. 19 2019. Osborne, E., Richter-Menge, J., and M. Jeffries (Eds.). 2018. “Arctic Report Card 2018.” Available online at https://www.srctic.noaa.gov/Report-Card. Last accessed Mar. 19 2019. Palmer, T.N. 2013. Climate extremes and the role of dynamics. PNAS. 110(14):5281-5282. doi:https://doi.org/10.1073/pnas.1303295110. Petoukhov, V., Rahmstorf, S., Petri, S., and H.J. Schellnhuber. 2013a. Quasiresonant amplification of planetary waves and recent Northern Hemisphere weather extremes. PNAS. 110(14):5336-5341. www.pnas.org/cgi/doi/10.1073/pnas.1222000110. Petoukhov, V., Rahmstorf, S., Petri, S., and H.J. Schellnhuber. 2013b. Reply to Screen and Simmonds: From means to mechanisms. PNAS. 110(26):E2328. www.pnas.org/cgi/doi/10.1073/pnas.1305595110. Rasmijn, L.M., van der Schrier, G., Berkmeijer, J., Sterl, A., and W. Hazeleger. 2016. Simulating the extreme 2013/2014 winter in a future climate. J. Geophys. Res. Atmos. 121:5680-5698. doi:10.1002/2015JD024492. Screen, J.A. 2014. Arctic amplification decreases temperature variance in northern mid- to high-latitudes. Nature Climate Change. 4:577-582. http://www.nature.com/doifinder/10.1038/nclimate2268. Screen, J.A. and I. Simmonds. 2013. Caution needed when linking weather extremes to amplified planetary waves. PNAS. 110(26):E2337. www.pnas.org/cgi/doi/10.1073/pnas.1304867110. Screen, J.A., Bracegirdle, T.J., and I. Simmonds. 2018. Polar Climate Change as Manifest in Atmospheric Circulation. Current Climate Change Reports. 4:383-395. https://doi.org/10.1007/s40641-018-0111-4. Shepherd, T.G. 2014. Atmospheric circulation as a source of uncertainty in climate change projections. Nature Geoscience. 7:703-708. doi:10.1038/NGEO2253. Taylor, P.C., Maslowski, W., Perlwitz, J., and D.J. Wuebbles. 2017. Arctic changes and their effects on Alaska and the rest of the United States. In: Climate Science Special Report: Fourth National Climate Assessment, Volume I [Wuebbles, D.J., D.W. Fahey, K.A. Hibbard, D.J. Dokken, B.C. Stewart, and T.K. Maycock (eds.)]. U.S. Global Change Research Program, Washington, DC, USA, pp. 303-332. doi:10.7930/J00863GK. Van Oldenborgh, G.J., de Vries, H., Vecchi, G., Otto, F., and C. Tebaldi. 29 January 2018. “A cold winter in North America, December 2017 to January 2018.” World Weather Attribution. Available online at https://www.worldweatherattribution.org/winter-in-north-america-is-cold-dec-2017-jan-2018/. Last accessed Mar. 19 2019. Waugh, D.W., Sobel, A.H., and L.M. Polvani. 2017. What is the Polar Vortex and How Does it Influence Weather? BAMS. 98(1):37-44. doi:10.1175/BAMS-D-15-00212.1. Waugh Research Group. 2019. 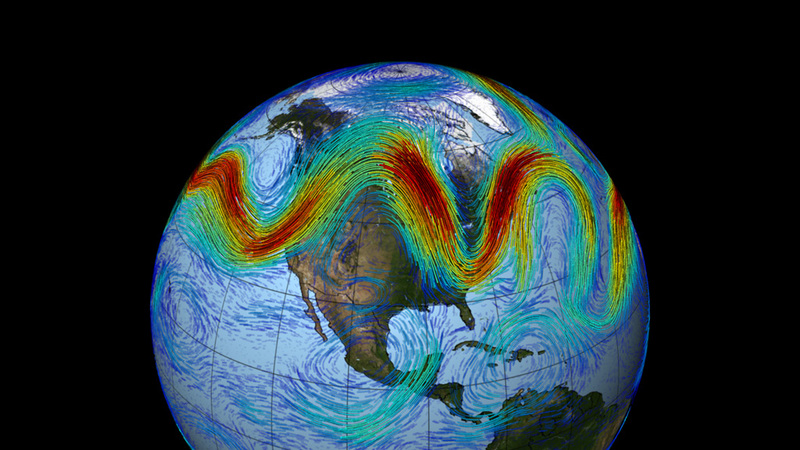 “What is the Polar Vortex?” Johns Hopkins University, Krieger School of Arts & Sciences. Available online at https://sites.krieger.jhu.edu/waugh/research/polarvortex/. Last accessed Mar. 19 2019.